BOM FRA was good choice given the connections at FRA which is a star alliance hub. BOM JFK : I hope this time it works out because unlike EWR, JFK will primarily depend on the premium business traffic. With AI's business product, I'm a bit skeptical whether this will attract corporates . Originally announced 3 weekly but The Hindu reports it to be a six day service. Please can anyone confirm this? BLR LHR : The route has PDEW 297 and thus is clearly underserved with only one flight daily (BA). However AI will require good amount of connections at LHR end to make it work well because I doubt how much local feed AI can get at BLR. I hope they code share with UA this time . Unfortunately, many of us will pay tax that will get used to fund massive losses on these AI routes. a) AI has repeatedly said that the BOM-EWR route is its single biggest loss maker (over 500M USD lost over 10 years)..why would JFK suddenly work, with the same type of equipment (300 ER)? c) BKK is soon to be a bloodbath. on another note- BKK used to be a great bisector hub for IC in the days long gone and SIN/HKG and the BKK terminators all did well. I reckon some indian carrier should set up a bisector somewhere in SE Asia (indogo?) to handle the sheer no of india tourists who need to touch BKK/KUL/SIN/DPS and increasingly HKT and HCMC. I have said this before: If you are an Indian resident taxpayer, every time an Air India pilot fires up his engine he burns your money along with jet fuel. It's a beautiful airport. Hope more airlines fly there and make good use of that new marvel structure. Gangtok is a lovely place and I'm sure it'll attract more tourists too. Only wished they'd built a longer runway to accommodate larger narrowbodies. It would be lovely then to see Pakyong connected to almost whole of India , directly or indirectly, someday by an airline like 6E. Last edited by avier on Thu Oct 04, 2018 12:14 pm, edited 1 time in total. Except that I'm not sure if AI and LH/ UA actually do much of passenger exchange at FRA. Other than IROP - where LH is happy to send you on an AI flight, the A++ JV ensures that UA/ LH/ AC stay clear of AI metal. Again - UA is tied into the A+ JV and has almost nothing to do with AI. Even today (a couple of years after AI joined *A), when you buy a UA ticket on BLR-BOM/DEL-EWR - the domestic sector is 9W and not AI. That would interesting if they codeshared with UA. Hopefully, this makes BA upgrade the old busted planes they use on this route. Why so negativity ? Think positive and welcome to A.net !! BOM-EWR was started in 2011 , was loss making when the aircraft they flew was load restricted due to illegal hoardings near BOM runway . However now the hoardings have been removed , the route has become profitable ( AI said that in March that all their US routes are profitable barring the one to EWR via LHR). As they have been facing with increasing demand for their US flights , they are starting JFK too . The Mumbai - NYC market isn't loss making any day. About BLR - LHR , good connections will make the flight work . BA/ ME3's presence does not mean AI shouldn't participate . The market seems good enough to be able to handle more than one daily non stop . Only thing is AI has to code share with UA for onward connections and not bank on just O&D / local feed. The rumour is that AI will deploy 77L on BOM-JFK, and upgrade DEL-SFO to 77W. Wikipedia (not a reliable source IK) claims BOM-JFK will be a 6-time per week 77L. Outside of DEL/BOM, AI should just stick to NB international routes like BKK/SIN etc. I wonder if BLR-LHR is being considered out of pure commercial reasons or is there some political force behind it. I am sure strengthening their DEL hub would provide much better network effects and once they have it completely set up they can look towards starting routes like BLR/AMD-LHR. This way AI can provide connections both ways to its large European network. Even on LH's website, when you try to book to PNQ (via DEL), you get UK as an option but not AI! Did Air India change their business class seats afterall ? There was quite a media event around launch of New "Maharaja" class. No photographs of new seats were ever shared. A fine example of how numerically challenged Indian journalists are. $35m is Rs. 250 crore, or 18 days of losses for Jet. Hardly a lifeline or bailout. SYD has a night time curfew. I honestly dont think BLR-LHR is for any political pressure, if it was..... it would have been launched many years ago. I feel its purely commerical reason and trying to attract more Star Alliance pax & use AI to fly to the US. This was in the talks for quiet sometime in the BLR circle, but since its AI, no one would trust anything unless confirmed from AI themselves. Hey look AI can make sensible decisions too. But what were they thinking when they operated a flight connecting two of the most competitive markets in the world with their vastly inferior product. New Jersey to Gujarat is too large and loyal of a market to ignore IMO. Additionally, I am not so sure they can maintain AMD-LHR without EWR. What are the possibilities they are just working a schedule to start BLR-LHR-EWR or BOM-LHR-EWR (which would still connect well for AMD-LHR at LHR)? Possibilities aren't much. EWR already has non stop from BOM and before people go further, it's profitable declared by AI . BLR LHR EWR also is unlikely given there are already many one stop options . AI can at the best code share with UA this time. I do understand that New Jersey has a huge Gujarati diaspora and that's the reason you'll see AMD, BDQ, STV fanboys ..... all ask for non stops. However that doesn't mean there should be a flight between EWR to AMD because first, there's no guarantee that AMD is the only city from where the diaspora is and second, most of them have their relatives in BOM and therefore will like to have a stop there. Plus at BOM, you get the business traffic too. There are a lot of gujjus near EWR, but a slot at LHR ain't cheap, and it's just easier to put them on to UA at LHR and go for higher-yielding BLR-LHR. For once AI is making a better business decision. Where is the slot going to come from at LHR? Looks like they used the LHR-EWR slot for BLR-LHR. I would say they are better off shifting the 191/144 EWR tag-on from DEL to AMD and restart BOM-BDQ if the idea is to serve the Gujarati diaspora in Jersey. I am not sure how 9W, 6E are able to support multiple BDQ-BOM per day and AI hasn't thought of returning. No idea what their service to STV is like though. As per their recent directive at AI, they are trying to cut down on costs by getting crew (cabin crew mainly) to be based out of the main long haul hubs like DEL to operate flights rather than have them positioned by deadheading there and paying for their hotel accommodation. So, by launching this new BLR long haul from where literally none of their long hauls operate and having no base for the long haul crew there, I don't understand why they chose to start this new route to LHR. They could have stuck to their earlier plans of launching the second frequency from BOM to LHR instead. Or probably added a new frequency from DEL. Also what feed do they have on either side to support this flight? Their network and frequency for domestic flights at BLR isn't that big. Are they purely relying on O&D for this sector? Seems like a bold move if they are. They could have stuck to their logic in line with their new directive and launched this new long haul from their respective crew/MX hubs for long hauls basically. I have seriously no hopes for this airline. AI is adding a red eye COK-BLR flight, for one. Well at a time BDQ BOM was served by AI , 9W , S2 . During PPs peak time , AI was forced to drop several profitable domestic routes out of which BDQ BOM was one. That was done to favor a new player at that time ...............Well I think I must finish it here!! They'll dead head crew from BOM temporarily and then place some long haul crew at BLR . Having no long haul ops from a city does not mean you can't launch one. When jet had started MAA-CDG last year , they dead headed some (French speaking) 777 crew from BOM to MAA for few weeks after which they had enough wide body crew at MAA so then they didn't need to dead head . They must have done the same thing with BLR AMS too . So I think AI will do the same with BLR LHR . Keep your hopes up man !! The airline is slowly restarting key routes . They did serve BLR - BOM- LHR during early-mid 2000s IIRC . Trujet is set to launch twice daily flights on MAA-CJB-MAA wef 28OCT18, most likely on wet leased ATR aircraft from Jet Airways. Along with the other recently announced flights, this makes it more than 2000 seats daily one way on this sector. Indigo to introduce flights to Male (effective Nov 15th) from Bangalore, Kochi and Mumbai. And to Phuket (effective Nov 23rd) from Delhi. Poor GoAir can't catch a break. G8's moderate growth strategy won't work when they have such an aggressive competitor. Also, with 6E's new flights to Male, they are effectively taking on all the existing India-Male route operators in one go, not sparing anyone for that matter. AI operates from BLR to Male , SG from COK, and G8 (will) from BOM. Also looks they aren't done yet with Kochi. They added their new first ever routes on these city pairs and increased frequency on many other routes which is hard to track and note. Now that the A321LR has obtained certification, I cannot wait for IndiGo to get their hands on some of these. This aircraft can redefine the competitive landscape for medium haul flying out of India and hopefully hasten the inevitable consolidation. In other news, COO of GoAir has called it quits. Tracking GoAir's C suite changes is getting as difficult as tracking IndiGo's network additions. Seems like its hard for anyone to work with the airline's owner. Also 6E's BOM-MLE flight schedule departs at the same time at noon as G8's. Feel bad for G8's int'l launch. They aren't spared anywhere. Both Flightradar24 and Flightaware are showing LY074 near the Persian/Arabian Gulf right now. Does anyone know why this is showing? FR24 takes time to recalibrate flight paths once the aircraft moves out of coverage area. It has been rectified now. UDAN has added 750,000 flyers to India's aviation traffic in 17 months. More than 7.5 lakh passengers have travelled on 15,700 flights operated under the government’s regional air connectivity scheme (RCS) in the last 17 months after the scheme became operational. Of the 7.5-lakh passengers, 4.5 lakh received subsidised air fares, which are being offered under UDAN, the government initiative to make air travel to India’s tier II and tier III cities affordable to the common man. The latest figures released by the Airports Authority of India, which manages the scheme, shows that the eight airlines, which are participating in the scheme, showed an average passenger load factor of 68 per cent on all the flights operated under the scheme. Passenger load factor shows how many of the seats on offer by airlines are filled. A total of 96 routes, including the Delhi-Shimla route, come under the scheme. Surat Airport crosses 100,000 passenger traffic for the first time in September 2018. The traffic was just 13,000 in September 2016! wow, impresive. on a lighter note has there been a decrease in BOM numbers by 87000?? A feature on how IndiGo has been ruthless in going after rival airlines' new routes, including the recent MLE and HKT launches. 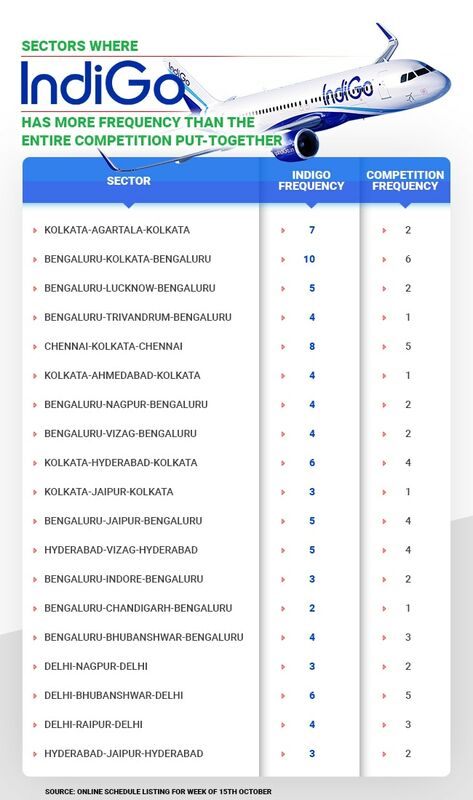 A summary of Bengaluru’s (BLR) performance over the past ten years, basically since commercial service was shifted from Hindustan Airport to Devanahalli. The lead photo shows the ceremony for AirAsia’s inaugural flight to Surat. The article does not say this explicitly, but I believe that in terms of international traffic flows, the historically active airports at both Meenambakkam (MAA) and Dum Dum (CCU) are well ahead of BLR. Forget history.... acc to monthly AAI traffic reports MAA is ahead to BLR wrt to Intl traffic and BLR > CCU. But yeah a good insight into BLR aviation scene by anna.aero, something which we dont get to see often! Their network mirroring strategy is something they've been doing since a while in the domestic market. But hadn't seen that on the international front. Especially launching two new overseas stations at such short notice which were another carriers launch stations for their international debut.